United States Army No. 1843 is a Fairbanks-Morse H12-44 locomotive built in 1953 as part of a group at a cost of $224,700 each. It is a 1,200 horsepower 120 ton yard switcher. In 1944, Fairbanks-Morse entered the United States railroad locomotive market trading on their excellent reputation in diesel power plants for marine applications. Their locomotives used an unorthodox opposed-piston design engine. During the next nineteen years, F-M achieved limited acceptance and rated a distant fourth place in market share during a period when all major American railroads were replacing their steam locomotives with diesels. F-M left the locomotive market in 1963 and focused on other areas of its business. 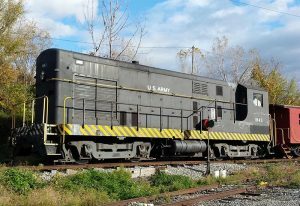 This locomotive was used most recently at the Seneca Army depot in Romulus, N.Y., (near Geneva) where it handled 30 to 100 cars per week on 42 miles of track at the base. In 1993, it was declared surplus by the Army, and a group of museum members purchased the unit for the Chapter through the Federal Property Assistance program. It arrived at the museum in May 1993. It is in operating condition and is used year round at the museum as the locomotive uses antifreeze and has a block heater for winter use. While many of 1843’s sister locomotives have been preserved at museums around the country, ours is the only operating Fairbanks-Morse diesel locomotive in the Northeast. We find our Fairbanks-Morse H12-44, USA #1843, idling and waiting to make a move. With two blasts of its horn and with the ringing of the bell, the 1843 slowly pulls a string of cars out of one of sidings at the R&GV Railroad Museum. USA #1843, our FM H12-44, climbs the hill out of the Industry yard trailing caboose, Erie C254. All is quiet with just the birds chirping until you start to hear 1843 pulling up the hill and going past; signaling an acknowledgement as it goes by.